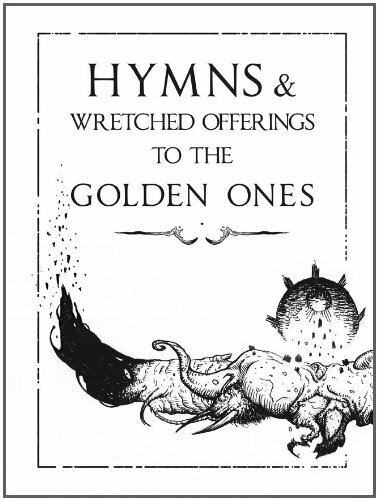 Jim Pavelec has just notified me of a book he released recently, Hymns & Wretched Offerings to the Golden Ones. This is an awesome and gruesome art book about demons and monsters. It's somewhat like Wayne Barlowe's art. But it's a different sort of offering, a slightly unusual one. To make things more interesting, there are poetry specially composed to accompany the drawings. The art is great. Looks to me like they are all traditional media with a good feel of textures. The drawings are mainly black and white, or very limited in colours. There are all sorts of unimaginable monsters. They are gross, horrific, evil-looking and scary at the same time. The designs are quite original as compared concept art from those zombie apocalypse type of video games. The illustrations are from Bob Eggleton, Mike Dubisch, Samuel Araya, Jim Pavelec himself and other artists. This is a terrific book for those who like creature, monster designs or diabolic art. Order thru your links. I love grim horror type art.